Author Written by Cleo Isco and last updated on Posted on November 24, 2017 . SAP MM FI integration is a good example of how different modules of SAP ERP systems are integrated with each other. SAP ensures that data from one module automatically flows to another module. 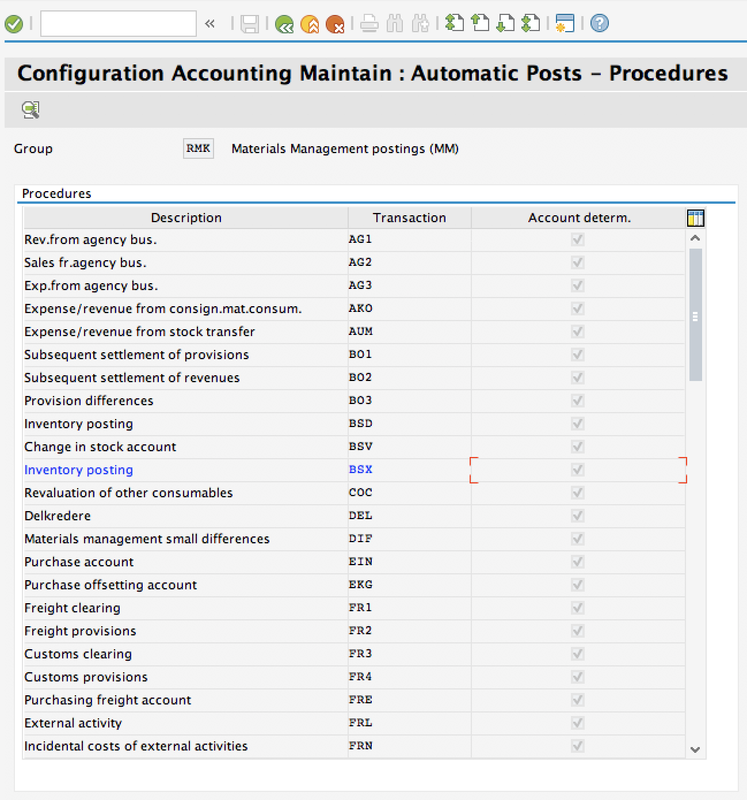 In case of SAP MM FI integration, functionality and data from SAP MM (Materials Management) module triggers automatic postings in SAP FI (Financial Accounting) module. 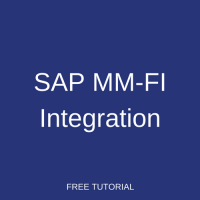 After reading this tutorial, you will learn about the integration points between MM and FI (there are several of them) and see an example of the integration in action. This tutorial is part of both our SAP MM course and SAP FI course. The tutorial will be divided into several parts. Let’s start with discussion of SAP MM FI integration in the area of inventory management. As you can tell from from its name, MM module is responsible for managing materials and inventory in SAP. However, value of the inventory must be reflected on financial accounts of a company. Stock of materials that a company has is its asset and it is a legal requirement to mention it on various financial reports. SAP ERP is able to automatically calculate value the company’s stock and keep financial accounts up-to-date thanks to the integration between MM and FI modules. Let’s discuss them in more details. The first parameter influencing automatic determination of accounts is the chart of accounts. 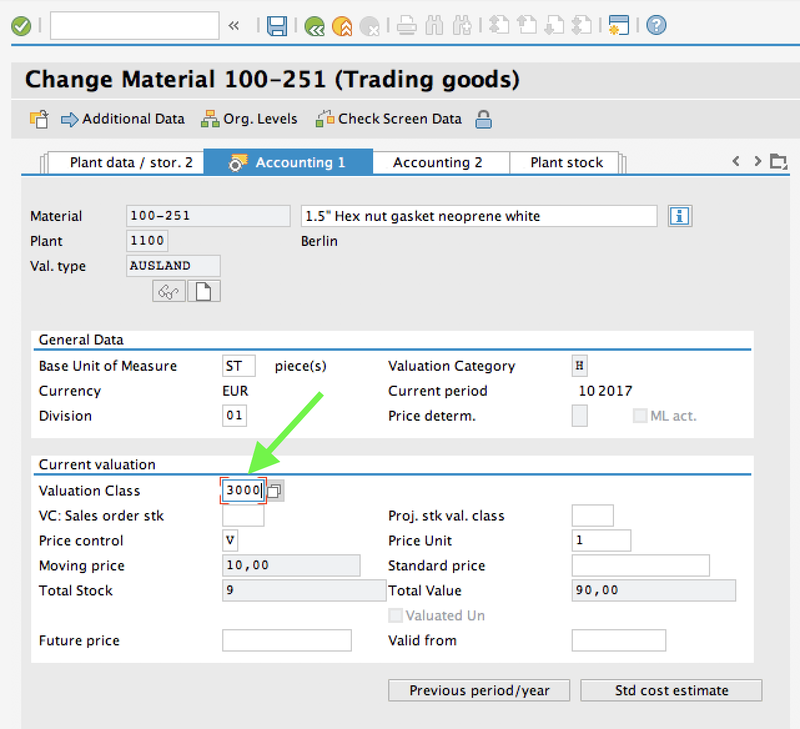 SAP determines the chart of accounts based on the plant mentioned in an MM transaction. Each plant is assigned to a particular company code (transaction OX18) and each company code uses a particular chart of accounts (transaction OB62). 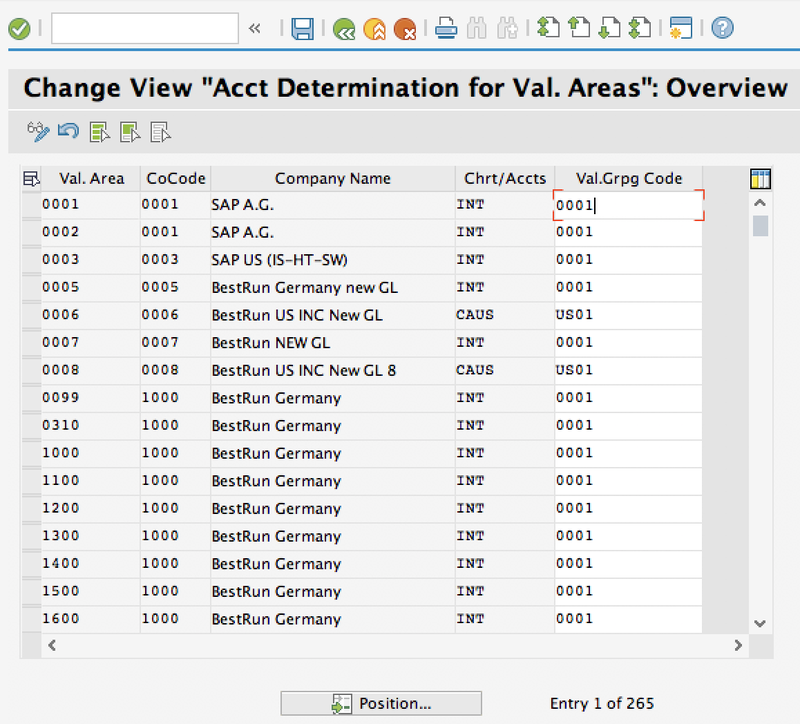 This is how SAP knows which chart of accounts should be used for account determination. Valuation grouping code enables us to customize account determination according to different valuation areas. 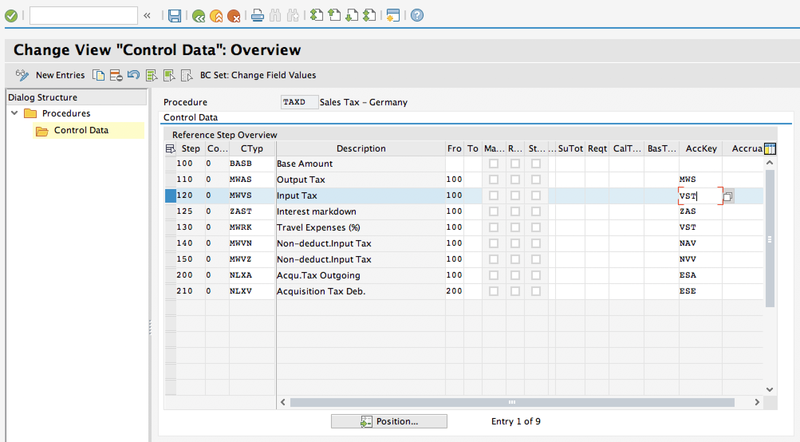 As you know, valuation level must be defined in SAP customizing (transaction OX14). It is possible to have valuation level at company code or plant level. Depending on valuation level, either company codes or plants will be used as valuation areas. Valuation grouping codes enable us to combine several valuation areas for the purpose of account determination (transaction OMWD). So, valuation areas assigned to the same valuation grouping code will be treated in the same way during account determination and will correspond to the same G/L account. Valuation grouping code simplifies maintenance of customizing because you don’t need to enter the same account determination settings for individual valuation areas. If you would like to use valuation grouping code, it first must activated in transaction OMWM. You cannot modify or add new posting value strings because they are standard and maintained by SAP. You can check which posting strings correspond to which movement types and other criteria in transaction OMWN. Several transaction/event keys are assigned to each posting value string. You can check table T156W to see full details of the assignments or you can also get a glimpse of the assignments in transaction OMWN by double clicking on a relevant line in the table shown above. Transaction/event keys are also predefined and you cannot modify them. They are used for internal processing by SAP. There are cases when postings corresponding to the same transaction/event key must be further divided. For example, offsetting inventory posting (transaction/even key GBB), can be done for goods issue or for scrapping. 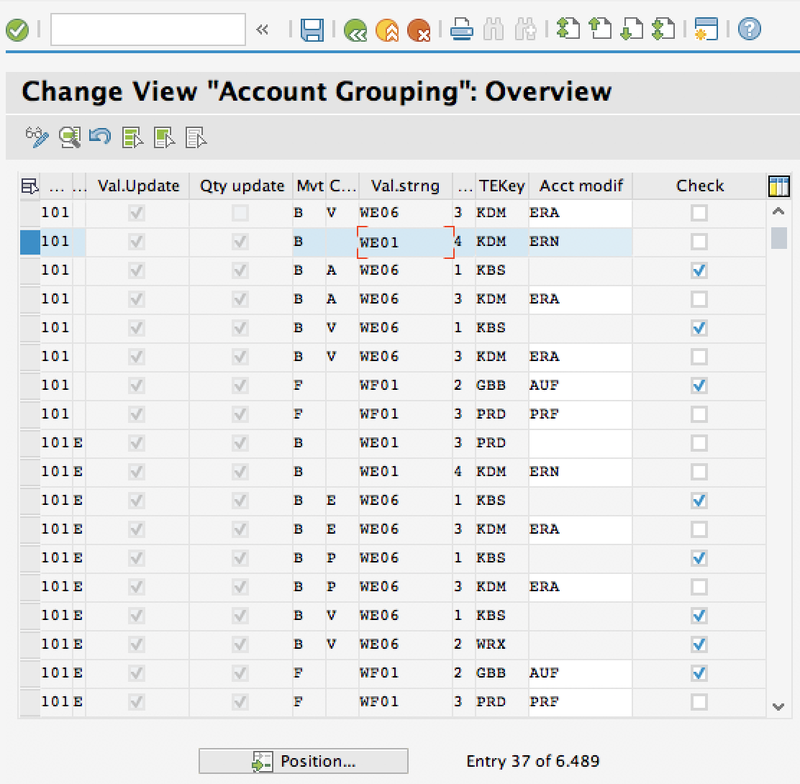 Account grouping codes enables SAP to differentiate between these cases and determine different accounts. Valuation class allows us to customize account determination according to a particular material. This is achieved by assigning different valuation classes in material master records on Accounting 1 tab. Now that we have understanding about different parameters that can be used for customization of automatic account determination in SAP MM FI integration, let’s see how different financial accounts are assigned to different combinations of these parameters. This configuration is performed in transaction OBYC. On the initial screen of this transaction you will see a list of all the available transaction/event keys. Double click on the line with a transaction key that you’d like to customize and the system will ask you for chart of accounts. Enter the relevant chart of accounts and proceed to the next screen. For example, we showed a screen for maintenance of G/L accounts corresponding to BSX transaction key below. As you can see, this transaction key doesn’t use all the parameters for account determination we previously mentioned. SAP enables us to choose which factors should be taken into account during account determination. So, for simple cases, we don’t need to use all the parameters but only some of them. The choice of parameters can be configured using Rules button shown on the screenshot above. Additionally, you can configure which posting keys (don’t confuse them with posting strings that we mentioned earlier!) will be used for automatic postings in financial accounting module. This can be done using Posting Key button for different rows in the account assignment table. Let’s have a look at a different example – transaction key GBB. 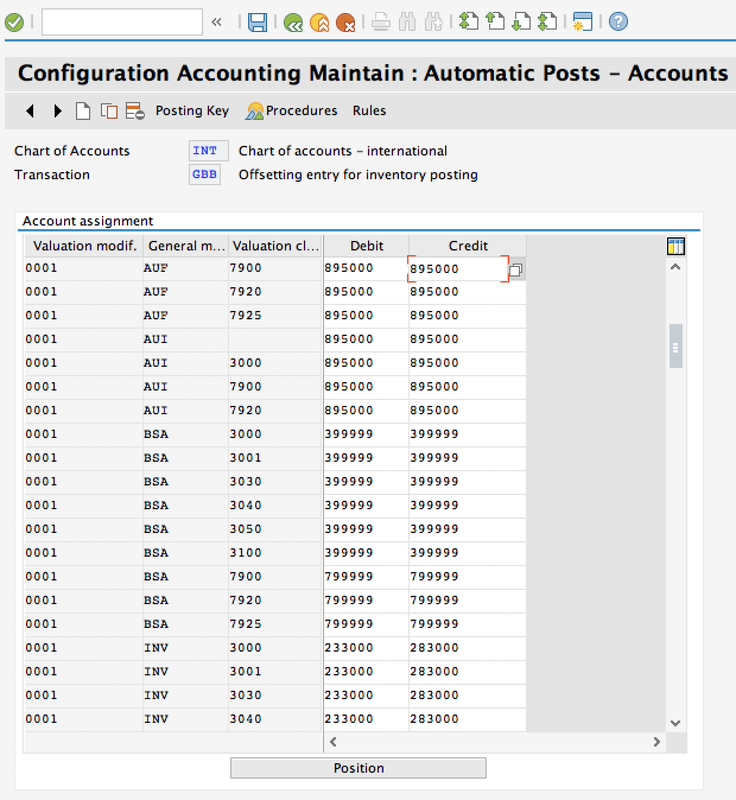 As you can see from the screenshot below, all the available parameters for account determination are used in this case. “Valuation modification” column contains valuation grouping code that we discussed earlier. “General modification” column contains account grouping code that we also mentioned earlier. Let’s also check Rules screen for this transaction key. We see that in the case of GBB transaction key, accounts are determined based on all available parameters. 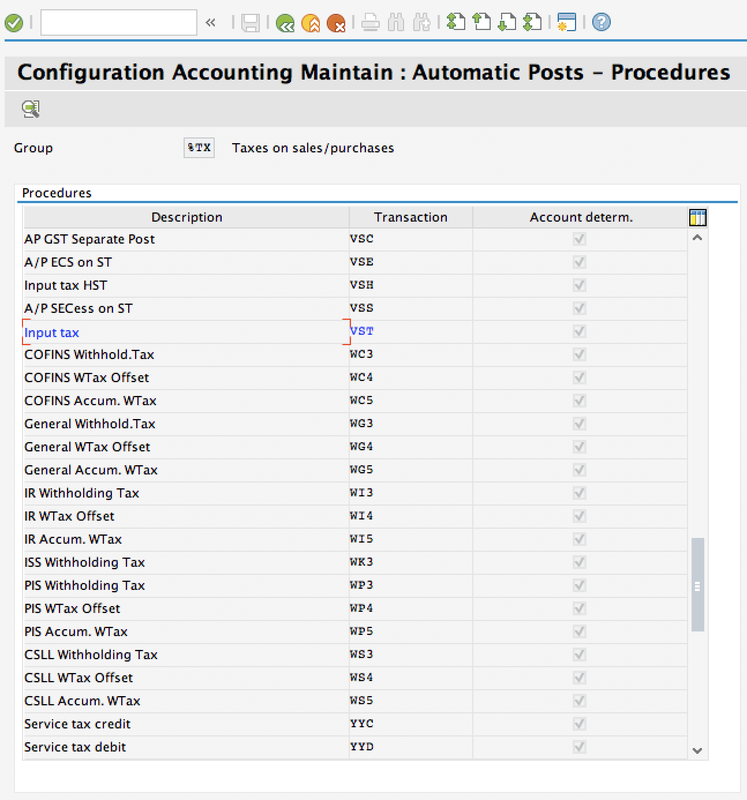 SAP system uses the information about account assignments that we maintained in transaction OBYC for automatic determination of G/L accounts based on the information in MM transactions. The logic of automatic account determination is the same as we discussed above. The only difference is in transaction keys that might be used by SAP during invoice verification. However, the there are more differences for vendor account determination and tax account determination. So, we will talk about them in the next sections. Vendor account is taken from the vendor master record. 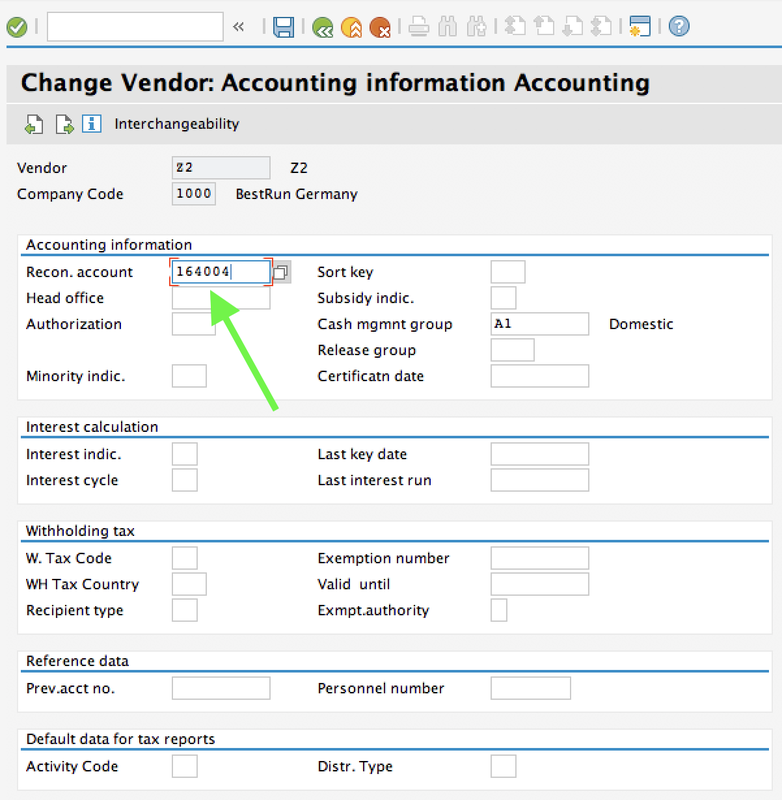 It is specified on Accounting Information screen in Reconciliation Account field. 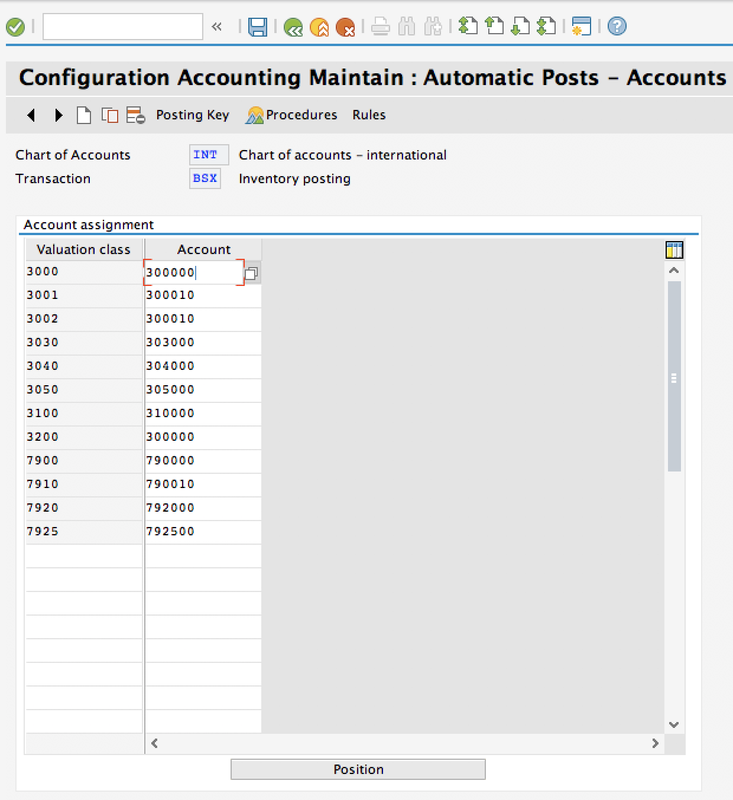 SAP makes a financial posting to the reconciliation account using SAP MM FI integration. Tax account determination is performed based on the tax code specified during invoice verification. 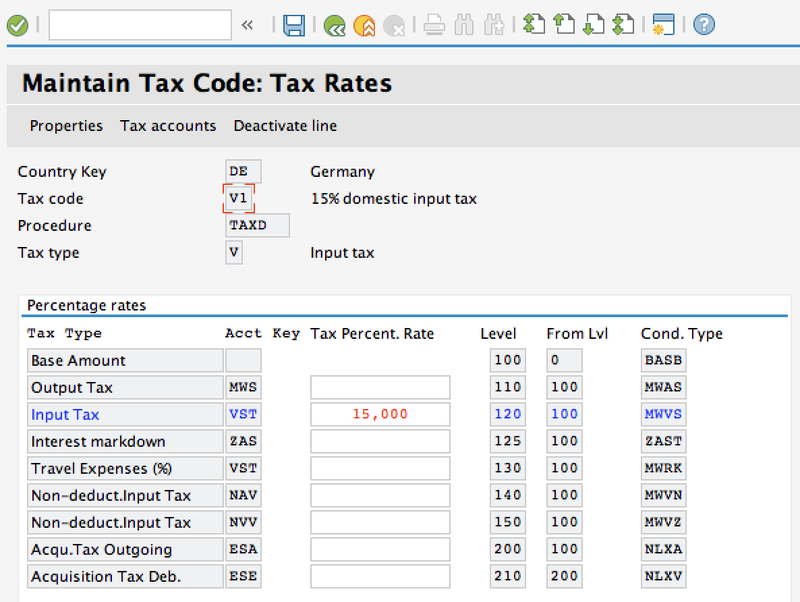 Tax codes for each country are created and maintained in SAP FI. Each country usually has a different tax calculation procedure. We can specify an account key for the input tax condition type in the calculation procedure. This account key is the same thing as transaction/event key that we discussed earlier. SAP will use the account key and customizing that we perform in transaction OB40 to perform automatic determination of accounts where taxes should be posted. As you can see from the screenshot above, OB40 looks very similar to OBYC that we discussed earlier. If you double click on one of the lines in the table, SAP will show you next screen where you can define account numbers for automatic postings. SAP MM FI integration is one of the advanced topics in SAP configuration. 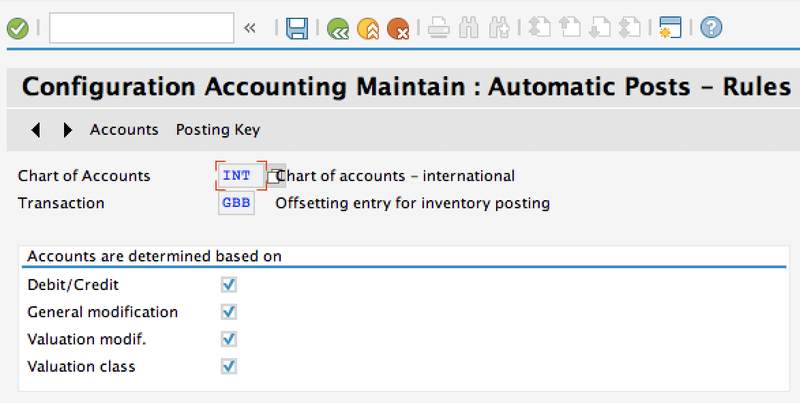 It is important to configure automatic postings in Financial Accounting and even more important to thoroughly test this configuration to make sure that postings are made to the correct G/L accounts. We hope that our explanation of SAP MM FI integration is easy and understandable. If you have any question or found a mistake, please let us know in the comments. Succinct but informative! Explains the key elements well! Yes, it’s looks good and informative but what I recommend you is if it possible please explain clearly like what are the GL Accounts we need to create and where we need to create weather it is asset or liability and how to configure OBYC related to BSX,WRX and GBB.with examples. FI documents is not generating after posting goods receipts.I am getting below mentioned error MB03. transaction. Please help me to resolve issue. The system cannot find an accounting document for the material document 4900003271. The goods movement has no relevance to accounting. Therefore, the system did not generate an accounting document for the material document. The material document is a document that was posted before Release 2.1. Such documents must be converted so that the system can find the relevant accounting document. The procedure for the subsequent calculation of value is not active in your system. For further information, refer to the documentation on the program for valuating goods movements: RM07MWBU. Choose Continue and then choose another function. Find out when the material document was created. If the document was created prior to the Release changeover, ask your system administrator to carry out the conversion of the documents. The individual steps required for document conversion are described in the Release Notes for Release 2.1B.